Steady & Strong: Training with Donkeys Molly Montag, Quarter Horse News, 3 April 2019. How a pair of shaggy donkeys named Shirley and Mabel, are helping foals through the weaning process. Miniature donkey takes the bus Greta Levy, Eastern Daily Press, 2 April 2019. A miniature therapy donkey from the charity Miniature Donkeys for Wellbeing, takes a bus ride in Beccles, Suffolk, in a bid to boost the charity’s chances of winning National Lottery funding. Beer Burros Are Our Favourite Cowgirl Wedding Trend Stacey Lorton, Cowgirl, 19 March 2019. Beer Burros are becoming a popular way to add the cuteness factor to weddings. Donkeys Own This Town in Arizona Ashok Ramprasad, Epoch Times, 19 March 2019. If you stop in Oatman in Arizona, along the historic Route 66, don’t be surprised if you are greeted by wild burros. How donkeys are helping kids with autism process their feelings Cristina Quinn, PBS 3 March 2019. 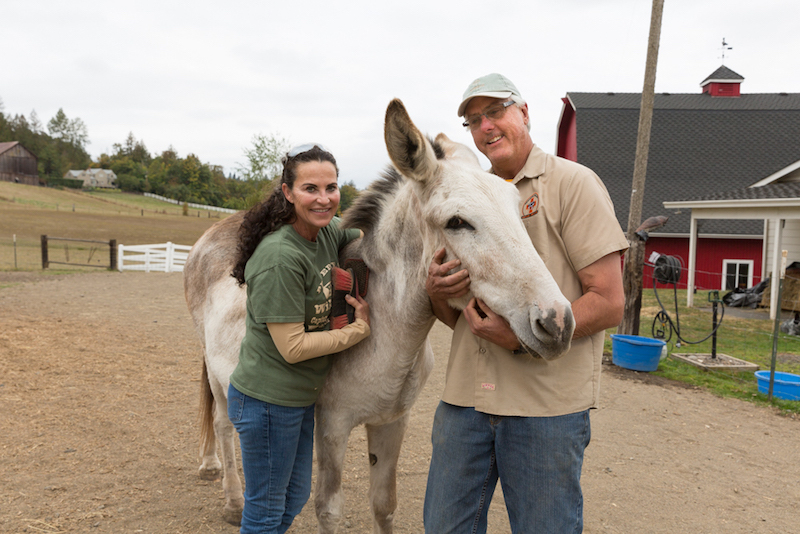 Donkeys at Cultivate Care Farms in Bolton MA are helping children with special needs to feel more comfortable with themselves and their surroundings. Roberta the donkey raised by sheep Laura Abernethy, Metro, 24 February 2019. Orphaned miniature baby donkey Roberta, now living at Folly Farm in South Wales, was looked after by sheep and now sees herself as one of the herd. As China’s appetite grows, Brazil worries over future of donkey population Duncan DeAeth, Taiwan News, 22 February 2019. Some in Brazil are worried that, at the current rate, export of donkeys to China for the Ejiao trade could threaten the long term existence of some breeds. Donkey rides firm from Hartlepool wins five-star award under new national animal welfare licensing lawsPeter Tennick, Hartlepool Mail, 18 February 2019. Blackberry Donkeys, run by Marie Bates, has received a five star award from Hartlepool Borough Council for the welfare of its donkeys under a new national animal welfare licensing system. Pakistan to export donkeys to China to earn foreign exchange Ashfaq Ahmed, Gulf News, 31 January 2019. More bad news for donkeys as Pakistan announces plans to develop donkey farms, so that it can export more donkeys to China, fuelling the brutal Ejiao trade. Donkey sanctuary provides ‘unforgettable experience’ to families dealing with grief Lottie Welch, Bridport News, 30 January 2019. Families who have been bereaved by suicide invited to experience a donkey-facilitated life skills session at The Donkey Sanctuary in Devon. 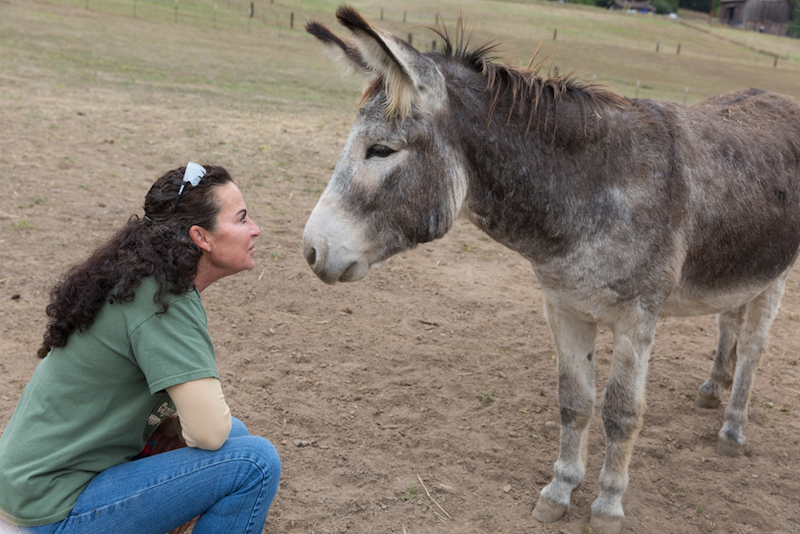 Peaceful Valley Donkey Rescue: Rhonda and Jim Urquhart’s Devotion to Donkeys Joni Kabana, Oregon Magazine, 25 January 2019. Arizona couple bravely move to a farm in Oregon and foster neglected donkeys via the Peaceful Valley Donkey Rescue, learning a whole lot along the way. Foster couple bring in the donkeys Teri Nehrenz, Mesquite Local News, 25 January 2019. Mini donkeys stop the traffic and bring offerings for the local food food bank in Scenic, Arizona.